Follow the adventures of a punk girl with a pink gun as she rampages across the land. The word is out on the streets: a reward of five million dollars to the opportunist that wastes the courier calling herself Bambi and returns the kid called Pampi she leads around on a leash. Can Bambi's huge ego and formidable gun skills hold off an army? 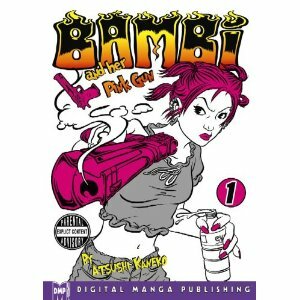 Featuring awesome art by Kaneko Atsushi and a story that's hard-edged, fast paced and loaded with action, chaotic courier Bambi delivers the goods. The word is out on the streets: a reward of five million dollars to the opportunist that wastes the courier calling herself Bambi and returns her living cargo. Chainsaw swinging psychos, gold-toothed Elvises, Derringer-packing grannies and all the other scum in these badlands could care less whether Bambi is kidnapping this toddler she christened "Pampi" or if she's snatching him back from his captors. With a pink gun in one hand, and a leashed Pampi in the other, can antihero Bambi's huge ego and formidable gun skills hold off an army?